The pilgrimage church of the True Cross is located on Gottesberg (Mount of God) near Bad Wurzach in Upper Swabia. The church was finished between 1712 and 1713. In the mid-18th century, brothers of the Order of Minims settled here. In 1762 they brought several relics to the mount, amongst them Holy Blood from which the church benefited highly. Since 1972, the church holds a statue of the Holy Mother Anne and her daughter Mary. The statue is deeply embedded into the history of migrants from Wurzach. First settlers left Upper Swabia in 1712 for Satu Mare in the northwest of Romania close to the Hungarian border. They took the Statue of Mother Anne with them. The baroque statue as presumably made by Johann Baptists Hops in Mietingen and was designed specifically for the migrants as a guardian for their travels. The statue was especially worshiped on parish fare days. The statue went on an adventurous 200-year journey and came to Bad Wurzach via Carei, Budapest, Salzkammergut and Heidenheim upon Brenz. 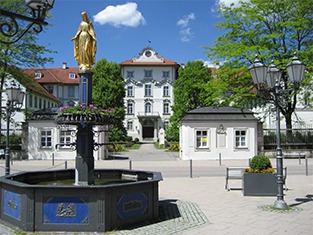 In Bad Wurzach, a song as well as a prayer has been dedicated to the statue. Today, the baroque statue from the 18th century can be seen on the northern side of the church. Every year, the former people of Sîi celebrate a parish fare on Gottesberg in Bad Wurzach. The statue has come to be a treasure of the Danube Swabians. Since 1928, a yearly procession is held on the second Friday in Juli, the widely known Procession of the Precious Blood. Up to 5.000 believers come to Gottesberg to celebrate the holy festival. In July 2012, the consecration of a memorial for the Danube Swabians of Satu Mare was celebrated. Wurzach Palace was built by Count Ernst Jakob Truchsess of Waldburg-Zeil-Wurzach in 1723. In the early 20th century, it was turned into a Salvatorian school. 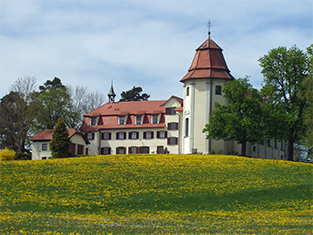 Monastery of the Salvatorian Order on Gottesberg in Bad Wurzach.